The lower part of Figure 5 shows the range of scores for the overall Global Gender Gap Index by income group (Table A2 in Appendix A details the income group categories used). Population-weighted group averages are indicated by a blue diamond. High-income countries have the highest average score (72%), followed by low-income countries (68%), upper-middle income countries (68%) and, finally, lower-middle income countries (67%). However, as revealed in Figure 5, there is a wide variety of gender gap outcomes within each income group. In 2017, out of the 46 countries in the high-income group covered by the Index, five have closed more than 80% of their overall gender gap, 26 have closed between 80% and 70% of their gender gap, 14 have closed between 70% and 60%, and one country is yet to cross the 60% threshold. Among the 40 countries in the upper-middle income group, 21 have closed between 80% and 70% of their gender gap, 17 have closed between 70% and 60%, with two countries having closed less than 60%. In the lower-middle income group, out of 40 countries, one has closed more than 80% of its gender gap, nine have closed between 80% and 70%, 26 have closed between 70% and 60%, and four countries have not yet reached 60%. Finally, among the low-income group, out of 18 countries, one has crossed the 80% threshold, five have closed between 80% and 70% of their gender gap, ten have closed between 70% and 60%, and two countries are yet to close 60% or more of their gender gap. Importantly, while the above does suggest a relationship between gender parity and gross national income—with a growing body of research and evidence strongly suggesting that gender parity can become a key driver of prosperity and national income growth (see next section and Figure 9 below)—the Index finds little evidence that a high GNI is in any way a prerequisite to making progress on gender parity. Figure 8 deconstructs the economic gender gap into two of its core aspects, wage parity and labour market participation. 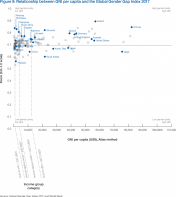 Within those dimensions it is evident that there are countries that exhibit more or less parity in every income bracket, yet there are varying trends by income group. 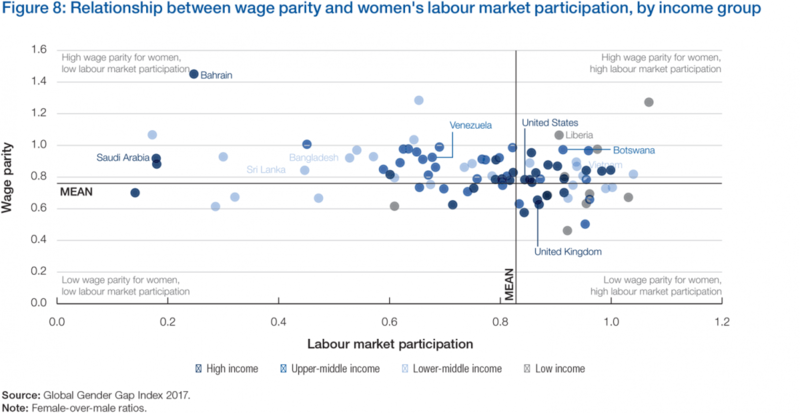 First, low-income countries are distinctly more likely to exhibit high labour market participation among women. On average, low-income countries have closed 92% of their labour market participation gender gaps. By contrast, lower-middle income countries such as Egypt, India, Sri Lanka, Bangladesh, Guatemala and Indonesia have, on average, closed only 67% of their labour market participation gender gaps. 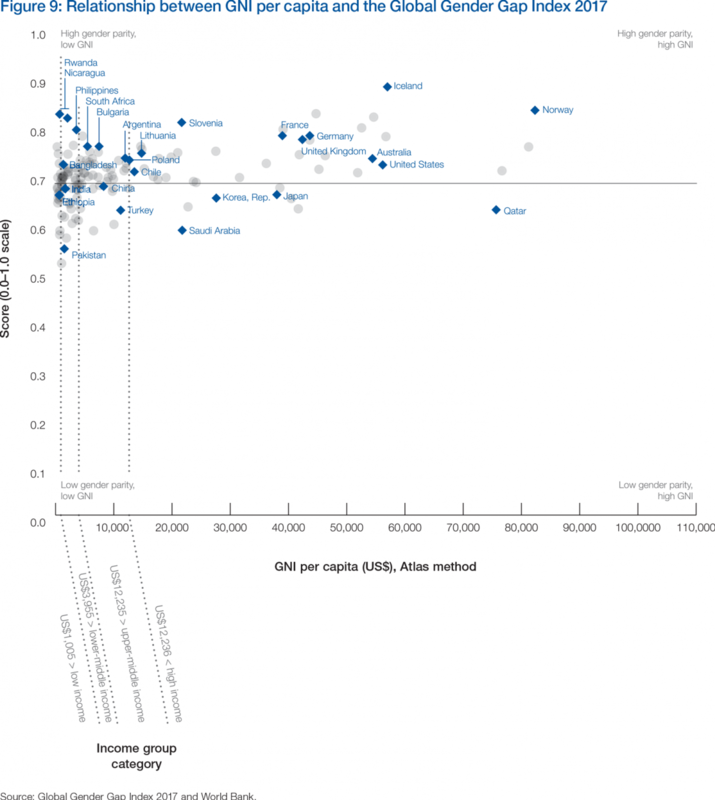 That figure rises to 75% for upper-middle income countries and onto 78% for high-income countries. Second, wage parity varies within a smaller range by income group, with wage gaps that are on average wider for low-income countries and high-income countries—with respective average wage gaps of 21% and 19%—than for middle income countries, with wage gaps of, on average, 16%. Finally, there are countries that have achieved high wage parity and high labour market participation parity simultaneously among all income groups, such as Lithuania, Botswana, Vietnam and Liberia.